Hello there! Here is a review on a very nice scrub from Bio Care. Read on to know more. I was in search of a body scrub for quite sometime. I came across this scrub online last year and immediately placed an order. The words 'turmeric' and 'sandalwood' were enough to convince me. The scrub comes in a large jar packaging with a seal. It is a 500 ml product. For a price tag of only 239 INR this is a really cost effective product. It will last me for more than a year. I use a clean spoon to scoop out the scrub. This way the scrub won't get contaminated. I wish Bio Care comes up with a 100 ml tube packaging as 500 ml is too much to finish up. This scrub has a cream consistency and spreads easily. It smells strongly of sandalwood. It contains granules which effectively gets rid of dead skin cells. A word of caution here though. The granules might be harsh on sensitive skin. So be careful. Due to this I never tried it on my face as facial skin tends to be delicate. I was also afraid that it might break me out due to its creamy consistency. I use this scrub on my neck, elbows, knees and heels. I would recommend using this scrub once every fortnight for best results. I wouldn't advise to use this scrub every 2-3 days as mentioned as I feel it is a bit harsh. Therefore I use it every fortnight or sometimes once a week. It did not dry up my skin. But I would advise you to use a moisturizer immediately after scrubbing. Be careful not to rub your skin while scrubbing. A light massage is preferable. This is the most effective scrub so far. I love the soft and smooth feel of my skin after using it. Regular usage effectively lightens the dark areas of the skin like knees and elbows. 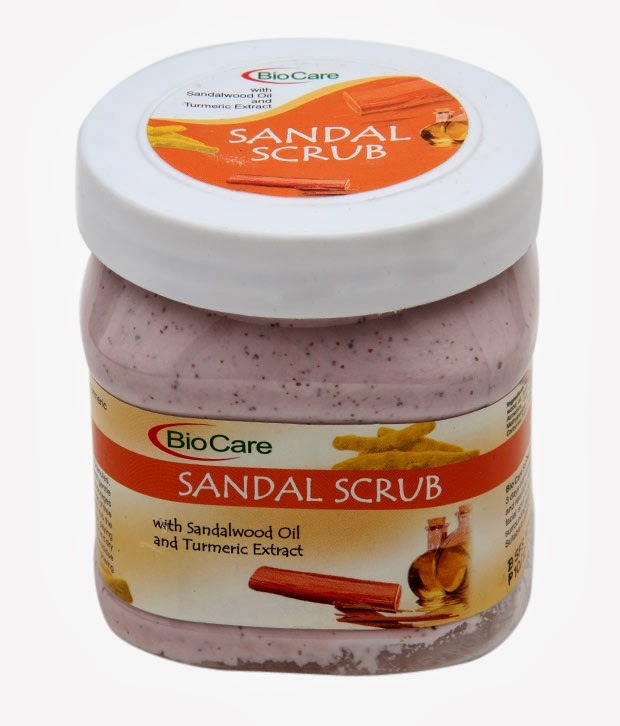 Bio Care has various scrubs which cater to the needs of every skin type. You can choose one according to your preference. I wouldn't recommend this scrub for sensitive skin. But if your body skin is normal then you may use it. Hey Naomi! This scrub is available on Snapdeal. You have a really nice blog! Already added!